This will probably become a regular feature. I read an early-1900s player's statistics and write about them for our OBP readers. Tonight we look at Rogers Hornsby. In the name of Pickles Dillhoefer, where do we begin? : Oh, here's where we begin-1924. Hornsby hit .424, which is the sixth-highest single-season average and the best mark since Nap Lajoie hit .426 in 1901. I'm willing to bet no one will hit .424 in a season until Albert Pujols' great-grandson hits .519 in 2054. In '24, Hornsby also had a .507 on-base percentage (absurd) and a 222 OPS+ (also absurd). I won the Triple Crown, then I won it again: Hornsby is one of only two players to win multiple triple crowns (Ted Williams is the other). In 1922, Hornsby had a .401/52/152 TC line, and in 1925 he pulled off a .403/39/143. Just imagine someone winning two triple crowns, four years apart, with those numbers. If the same thing happened in, say 2010 and 2013, people would be evacuating cities thinking they had just seen an alien. Sorry, Joe Morgan: But Hornsby is the greatest second baseman of all time. 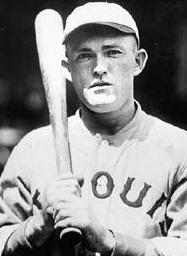 People say Joe Morgan all the time, but I say Rogers Hornsby all the time. Rajah's career slash numbers are .358/.434/.577. Morgan: .271/.392/.427. Hornsby hit .380 or better seven times. Morgan hit a career high .327 in 1975. And I know all of the live ball era arguments-Hornsby played in a hitter's era, Babe Ruth ate a lot of hot dogs....but when Morgan played did they take out the cork and the pitchers just tossed the cowhide? Yes, Morgan played in a tough hitter's era. It was an era in which he didn't hit even close to as good as Hornsby did in his worst seasons. Seems like a good place to stop.